Bakwaas Trading: 20151203 - Finally, a decent profit day after a long time!! 20151203 - Finally, a decent profit day after a long time!! Today was a good day, or as I call it - a lucky day. 3 trades, and I think all of them were good. Profit taking - something that I can always complain about - not too bad. 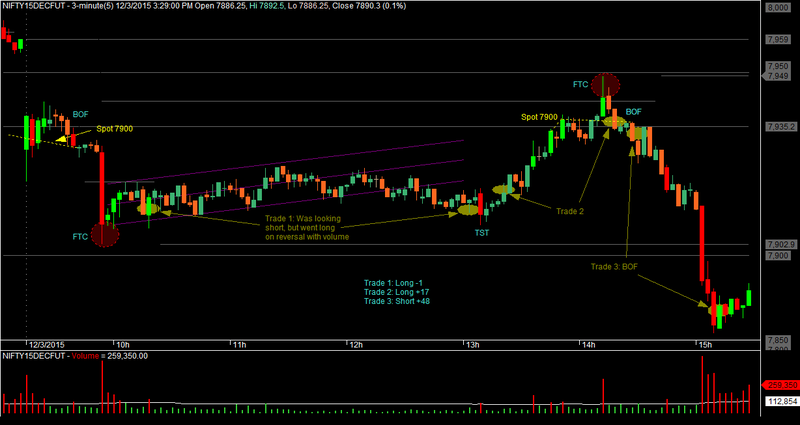 The last 2 trades zoomed into profit, so there was not much to do on those. One took an hour for 17 points, and the other 45 minutes for 48 points. The first trade took 2 hours and 45 minutes for a small loss. That one was more tricky than the others, and I had marked a channel for Price to move along, but it deviated and fell down and had to get up all over again ☺. Note that I could have locked in a small profit on it anytime, but I chose to be wiser (or sillier) - I don't know which was it. My last 6 trades have been: +15, +9, +12, -1, +17 and +48. That's good, but what I am really happy about is the MAE's on these trades. Those are 0.00, 0.00, -0.60, -2.60, -2.55 and -2.20 ☻. Am I intelligent or what? Thinking about it... I was lucky with Trade 3. At that point, I was not looking for a trade, and was off the screen. Then, I happened to look at the chart and see the 2 small bars, and was able to place my entry just in the nick of time.